How to slow down time? It has been a long time since I wrote anything and we last got in touch. There was so much to write about but I never got around to doing it. There are so many Liberia stories which still need to be told. In addition, my life has seen lot of change in the 2.5 years since the last post. I have had a beautiful daughter who is a source of eternal joy to me and my wife and I left my job to start a new company. Changing diapers while trying to figure out the nuts & bolts of building a company and while steadily going bankrupt is a highly fun, stressful and chaotic activity. It has been fun to do conference calls discussing plans for world conquest with a wailing baby in one hand providing background soundtrack. I feel that I can legitimately claim to have some idea of the life of a single mom. In short, life in the last 2 years has not been short of drama and things to write about but the mental space has certainly been in short supply. Anyhow, I am hoping to change it and start writing more. The posts now are going to be more diverse in character and draw upon my experiences as an entrepreneur and a dad. They are going to be less about far away places and more about the far away states of mind that lie within us. With that long backgrounder, let us get started. As I spend my days running after my daughter, Kamakshi, it is fun to notice and think about the differences between the life of an adult and a child. We, the adults, keep talking about meditation and esoteric terms like ‘mindful living’ as ways to deal with daily stresses. Most often we don’t really know what ‘mindful living’ actually means or how to go about it. When I look at my child, I suddenly understand what ‘mindful living’ is. She has no conception of yesterday or tomorrow and spends no time thinking about what happened yesterday or what might happen tomorrow. She is fully engaged in the world around her right now, be it the Northern Cardinal or Koel cooing in the background or the fire brigade passing by. Running after a fluttering butterfly or watching a caterpillar eat a leaf is a source of tremendous joy. 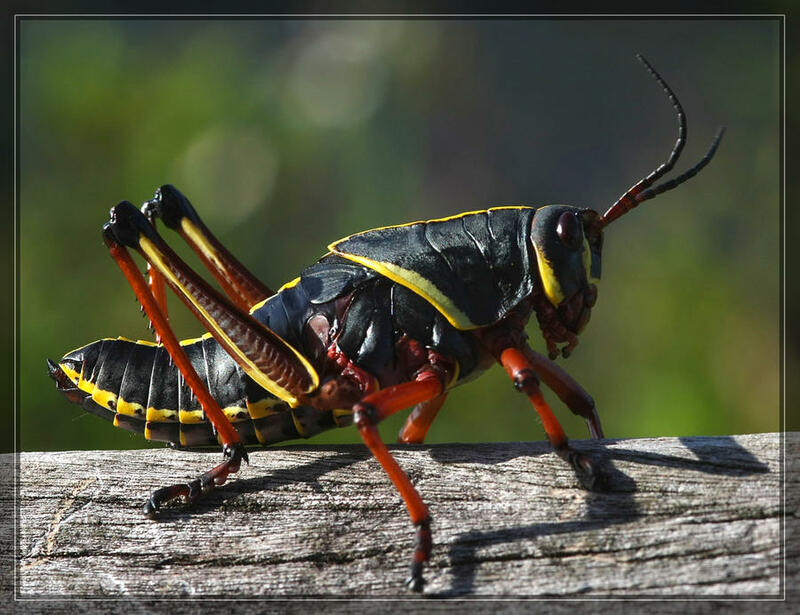 A few days ago when we went out in our backyard in Florida, she showed me a black & yellow grasshopper. I had never seen that grasshopper before and after she showed me one, I suddenly realized that our backyard was full of them. http://entnemdept.ufl.edu/creatures/orn/lubber.htm. It actually shocked me and I realized how much life is around us, living right under our nose, but we never even see it. That is when I realized that the child actually lives in this world while we, the adults, live in our minds. ‘Mindful living’ is nothing but beginning to live like a child and engage with our natural world and the here and now and disengage with our incessant chattering mind. The engagement of Kamakshi with the world led me to think about the paradox of how long and vivid our childhood seems to be and how life suddenly speeds up when we become adults. Growing up from 5 to 15 feels like forever but you go from 30 to 40 in the blink of an eye. (I admit to crossing the 40 mark and am still surprised how quickly i got there). Every year from 5-15 is etched in memory but 30-40 is an indistinguishable blur. Again, looking at my child, I realized that everything in the world is new and exciting for her. We were taking a plane to come to India and she was agog with excitement all day. Everything in the airport, the train and the plane was a source of wonder and joy. She kept observing every single detail – the colors, the metallic birds hanging in the terminal, the seats , the sizes of various planes and kept exclaiming, ‘we will sit in the plane and go shooon to India’. I don’t remember the last time I was so excited about anything. And, I wonder if that is the key to the paradox. When we were young, everything was new, there was a sense of wonder and the thrill of discovery. We didn’t know what to expect and paid attention when something was happening. We didn’t have fixed ideas, instead learnt as new things came up. But, as adults we lose that sense of wonder and behave as if we already know everything. I have a hunch that it is the loss of this sense of wonder and the lack of attention which makes the time speed up. When I came to US 13 years ago, it was completely new to me. Me and my wife were broke graduate students but just the simple act of walking through town and discovering new streets was a joy. It was like a second childhood and we have very vivid memories of simple things like taking a bus to the Middlesex Fells just outside Boston. The memories of those first 2 years are much stronger compared to the memories of next 10 years when we got a car and had more money to go to far off places. So, coming to the question in the title of the post, how do we make the time slow down? I think that it is easy – be more like children, learn new things, do things which you have never done before, things which interest you and, more than anything else, pay attention and the time will slow down and we will make some memories that will last a lifetime. P:S – I think that it is the same thing which makes entrepreneurship exciting. Contrary to what most entrepreneurs outwardly say, the reality is that you actually don’t know what you are doing. Trying to figure out your path in the fog of ambiguity is what actually makes entrepreneurship fun. If you already knew everything before you started, it would be so boring. This entry was posted in Personal experiences, Reflections, Uncategorized and tagged Boston, childhood, entrepreneurship, Florida, India, travel. Bookmark the permalink. Thanks for your sharing your thoughts, Kapil. And, beautifully written! https://www.youtube.com/watch?v=usb2435vSZA Check this out in response to your recent post. You may cry. When I had less than a dollar in my bank account!